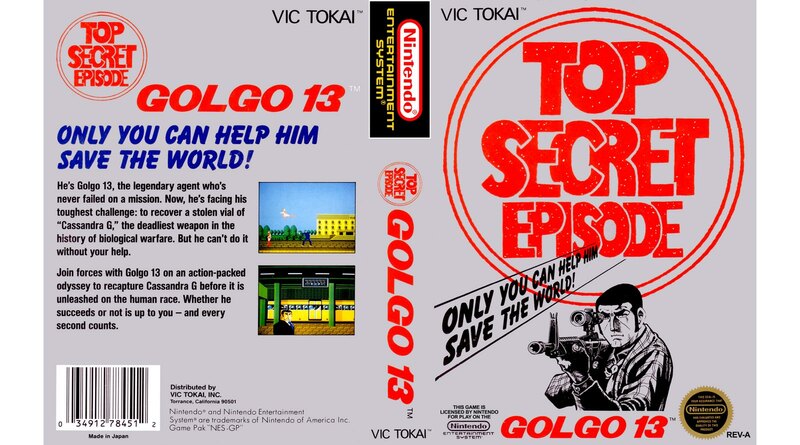 Golgo 13: Top Secret Episode is a new action game from Vic Tokai. Based on a popular Japanese Manga series, Golgo 13 is a hired spy and assassin and he must locate the vaccine for a biological weapon that has been dispersed over New York and kill the leader of the terrorist organization responsible. Your task won’t be easy, however, as you will have to fight your way through exotic locations and learn gameplay mechanics from several different genres of games. The variety keeps things fresh, but the overall execution leaves much to be desired. This adventure takes you all over the world from East Berlin, Brazil, and the Antarctic. There are 13 missions in total, and quite a bit of variety in the levels. Most are action-oriented where you fight and shoot bad guys, as well as talk with allies to obtain clues and progress the storyline. There are underwater levels where you scuba dive while avoiding mines and ferocious sea creatures. There are even side-scrolling stages where you fly a helicopter and shoot down enemies. Finally there are labyrinth first-person maze areas. The action in this game is nothing spectacular, but serviceable. The game’s selling point is its extremely in-depth story, fascinating characters, and adult themes. There’s a lot of dialogue and there are dozens of cutscenes. This game plays like an interactive movie, and no other Nintendo game is really comparable to this. I only wish the action was more refined and a bit more fun. Much of the music is dull, but the game features solid sound effects, as there’s a lot of shooing. I didn’t care much for the art style, but fans of the manga series will surely appreciate it more. Golgo 13 is in a league of its own when it comes to story and plot development. I really respect the game for its originality and terrific writing. Most other Nintendo games keep the stories confined to the instruction manual. It’s nice to see a game geared towards a mature audience filled with graphic violence and sexual undertones. This is a great one to introduce Dad to video games. Sadly the gameplay itself is not going to wow anyone. It’s not horrible by any means and I liked the variety in stages, but I think the developers are onto something with the way the story is told.